Spring is a time of rebirth, you can feel nature renewing itself, reborn after winter’s dormancy. We feel the surge of the Sun’s revitalizing energy that naturally cleanses and motivates us. Imperial Pink Sapphire supports the heart and mind, cleansing the heart chakra with the Pink Ray of love and activating the brain with the Golden Ray of Jupiter. Sapphires are recognized as one of the most powerful gemstones. Most people think all Sapphires are blue. In fact, it is known as a rainbow stone coming in every colour of the Rainbow. From beautiful vibrant canary yellow to the orange seen in the Padparadscha Sapphire, to pink, to violet and blue. In order to provide vibrationally intense gemstones in large sizes, our collection features Sapphires grown in a lab. They are identical to earth-grown Sapphires in every way; color, crystal structure, hardness, composition, luster, and most importantly vibrational resonance. In fact, the highest grade of earth-grown Sapphires is often mistaken for lab-grown as the only difference are the inclusions found inside the earth-grown stone. All Sapphires have a hardness of 9 on the Mohs scale. It is the 3rd hardest gem next to Moissanite at 9.5 and Diamond at 10. Untreated earth-grown Sapphires have become extremely rare in the sizes needed for vibrational use. Our lab-grown Imperial Pink Sapphires are stunning and powerful. 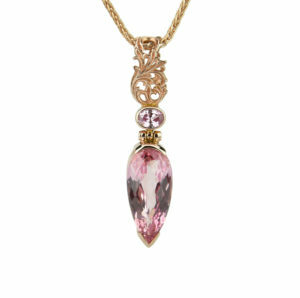 This stone combines the Imperial Golden Ray of wisdom and the Pink Ray of love. The Imperial Golden Ray activates the intellect and Christ Consciousness, while the Pink Ray cleanses and opens the heart, attracting love. It assists in removing all the lower emotions; fear, anxiety, resentment, and insecurity allowing your heart to revitalize itself. Combined with the Golden Ray of the intellect that assists in tuning into your highest path, making the best choices to support your journey. The Golden Ray is the Ray of Jupiter, the planet of success, happiness, and health. If you want to cleanse your heart from heartbreak, attract a new love or enhance your love relationship, this tool will assist you in achieving all this and more. It will make you feel more loving and you will feed the universal consciousness with the frequency of love. Imperial Pink Sapphire brings light and soothing vibrations to the heart and invigorates the emotions. It will assist you in feeling more confident, loved and supported by lifting your emotions from dwelling on the past, encouraging forgiveness and letting go of what no longer serves your highest path. It brings passion to life and encourages loving playful energy in relationships. Wisdom is one of the most empowering frequencies we can engage. It activates non-judgment and grace, two of the greatest gifts you can bestow on yourself and others. This stone unites you with your sacred self and your divine life purpose. Confidence and happiness blossom when you forgive and love yourself completely. When you accept yourself and everyone else exactly as they are you can live with honor, loving-kindness, and freedom. Engaging this stone elevates the frequency and ignites a passion to be your best. Wearing the Imperial Pink Sapphire promotes a positive attitude towards life, enhancing self-motivation and pursuing a path of self-fulfillment and well-being. Be your best self, step into Spring with vibrancy and your highest vibration.